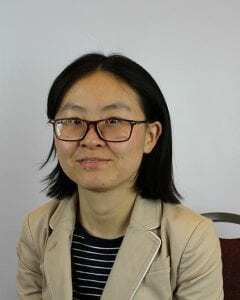 Lu Yin is a PhD graduate research assistant at the University of Minnesota. She grew up in urban southwestern China and has long had an interest in growing house plants. Lu came to the University of Minnesota in the fall of 2010 for a Bachelor’s degree and afterwards a Master’s degree in Applied Plant Science. She joined the University of Minnesota grape breeding program and the VitisGen2 project in the fall of 2016, when she began working as a Ph.D. research assistant in Dr. Matthew Clark’s grape breeding program, investigating grape genetic resistance to phylloxera, a gall-forming insect and a pest of grapes. What got you interested in grape disease resistance and breeding? Before I joined the program, Dr. Clark told me that there was this project on phylloxera resistance. I was intrigued by the intimate relationship of phylloxera and grapevines where hormones like auxin might be responsible for gall formation. Not to mention that I like eating grapes! In addition, I had my Master’s background in breeding genetic resistance in barley. Thus, I took this opportunity that seemed well-suited to my expertise and with which I could expand beyond that to work in a system I had been interested in. The more I work with genetic disease resistance, the more it fascinates me, where the classical “one resistance gene to one pest gene” model is just one possibility. One thousand grape seedlings, which will be evaluated for foliar phylloxera resistance in an effort to breed new hybrid varieties exhibiting many desirable characteristics. What is your role with the VitisGen2 project, and how does your research fit in with the overall goals of the project? My role is applying next-generation sequencing technologies (which were developed by the VitisGen2 project) to grape breeding, which in turn will improve the usability of such technologies. This will result in more efficient development of grape varieties for the cold-hardy hybrid grape industry. The image is the hybrid grape population of 1000 seedlings that I am working with that utilized one such technology, rhAmpSeq . I am studying their genetic resistance to foliar phylloxera. 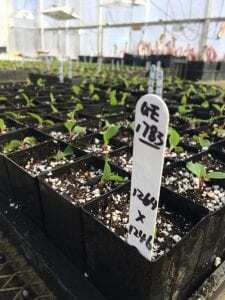 One thousand seedlings is a large number for a mapping population, and it allows for higher-resolution genetic mapping of the trait. What are some major challenges faced by the industry/breeders, and how will your work address them? As the interest in sustainable and local foods grows, the cold-hardy hybrid grape industry is also growing. In the Midwest, hybrid grape varieties are usually developed from the European or domesticated grape species Vitis vinifera and the North American native grape V. riparia. Although V. riparia is cold-hardy, it contains many undesirable traits including foliar phylloxera susceptibility. My work utilizes a hybrid grape population developed from six different Vitis species to map genetic resistant regions to foliar phylloxera. With the help of genetic markers such as those developed through rhAmpSeq, the breeding process can be more efficient and allow for screening of more seedlings to be used as useful parents in the next crosses. The development of a pest-resistant, cold-hardy hybrid grape will help grape growers save pesticide costs, lead to a more sustainable environment, and benefit the growing cold-hardy grape industry. Besides the rapid research break-through and the fascinating science behind it, I enjoyed the discussions at the 2019 VitisGen2 meeting and getting to know the members afterwards. I liked getting to hear voices from many different perspectives, and feel fortunate that our members really care about their research/business and are actively involved in making VitisGen better. I was glad to meet people of many different backgrounds, including the experts who offered specific technical insights and those who attended the meeting for the first-time and inquired questions that I also had. What tip would you give someone just joining the project (or just beginning a career in plant science and genetics)? Don’t be afraid to ask or speak! Whether it is a question you assume everyone else knows, or in a situation that everyone seems to know what they are doing. What’s a typical day like for you, including both work tasks and what you look forward to when you get home? In the morning, I take care of the grape plants and colony in the greenhouse including watering, pruning or propagating, anything that is necessary for plant growth. I also sit in front of the computer for some amount of time, whether running statistical analysis, writing, emailing or coordinating the next steps of my research. Sometimes I am doing tissue culture to observe resistance responses in the lab. Other times, I am harvesting grapes for yield/quality measurements at a grape grower’s farm to investigate the impact of phylloxera infestation. I often help with various aspects of the grape breeding program, from purchasing lab supplies to reading journals together with other lab members. What inspiration do you use to stay engaged and focus when the work gets repetitive? Listening to hymns or piano, sometimes singing a few hymns reminds me of my values. Chatting to office-mates or having lunch with friends lets me know that I am not alone and keeps me motivated.